Disgraced Pulitzer-prize winning reporter Tom Sagan had his gun to his head when Zachariah Simon (who we met in “The Admiral’s Mark”, see my review) entered his home and offered him a deal. Simon would not kill his daughter, Alle, if Tom would help him locate priceless Jewish artifacts hidden from the world in 1492, by, none other than Christopher Columbus. Putting off his own demise for awhile, Tom did what this intruder asked. With his reporter instincts kicking back in, Tom, decided to take matters into his own hands as he decides to find the treasure himself. Tom comes to learn that his father was the last male protector of the secret. This secret could not be passed on to Tom since he renounced his Jewish faith, but, his father did take it to his grave, where Tom retrieved it. “The Columbus Affair” is a mix of history and fiction. The settings range from Florida, to Vienna, to Prague, to Jamaica. 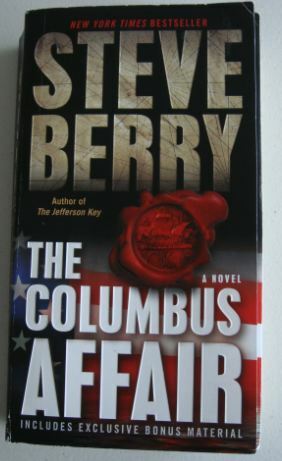 Not Steve Berry’s best (read “The Amber Room”) but it is an interesting treasure-hunting jaunt around the world with a bit of Jewish history and facts we never knew about Columbus.